Flatirons Tuning Project Car: Part 5: INTAKES DON’T WORK! Or do they??? Part 5: INTAKES DON’T WORK! Or do they??? Well, I have no idea. Or, at least had no idea. There are basically two theories out there. The first is that the best intake that you can get for the WRX happens to be the one that comes with the car. This is nice because everyone all ready has it. Of course, you can add a high-flow filter to help it flow a little better, but otherwise, just leave it alone. Is there horse power out there that I am missing out on? Well, I have had my suspicions for a while, but they were just that. Suspicions. There have been a couple intakes that have come out lately, namely one made by Subaru Performance Tuning (SPT) that made me wonder if I was still holding fast to a concept that has gone the way of OBDI. Then there is the fact that for virtually every other tuner car out there, an intake is the first power mod that people do, and with good results. Clearly it was time to do some experimentation. I mentioned my idea to Kris at Logic Imports, and it turns out he was as curious as I was. With a dyno secured, all that was left to do was to pick an intake, and set up a testing criterion. As far as what filters to use, well, the baseline was clearly going to be the stock air intake system, with a Subaru filter. 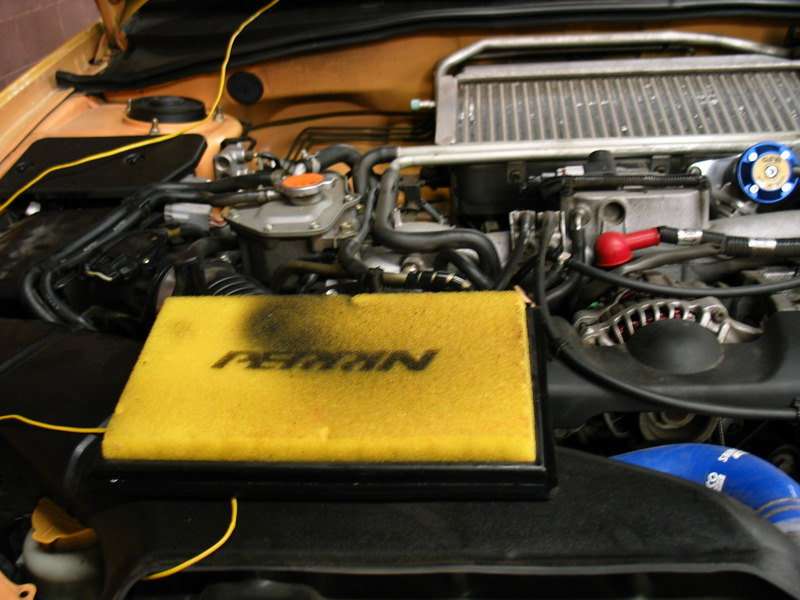 Next, I have been running a Perrin Foam Panel filter for the last couple thousand miles, so that was a natural second filter. The Foam filter is at least as free flowing as a cotton gauze filter, if not even better, so it should give a reasonable result for a panel filter. If you decide to put an intake on your car, the most important piece of information that you need to know is if it is designed to work with the stock Mass Air-Flow Sensor (or MAF). If there is something that separates Subaru’s from other cars when it comes to intakes it is the fact that their MAF sensors are much more sensitive. If an intake isn’t designed to work with the stock MAF, it can create turbulence that cause the MAF to read out of range. This will throw a Check Engine Light (CEL), and it means that there is air getting past the MAF that isn’t being metered, causing you to run lean. This is a real problem. In my opinion, if you have an intake that is throwing a CEL, it needs to come off immediately, or get your car tuned to re-calibrate the MAF signal. Those stories about an intake blowing up the engine if your Brother’s Cousin’s former room-mate’s WRX could very well be true. I have seen it happen a couple of times, and I just don’t think it is worth the risk. So first we need an intake. There are a few out there to choose from, and we decided to go with the SPT intake for two reasons. First, it bolts on easily, and it almost looks like a factory part, which isn’t surprising as Subaru made it. Second, this is the intake that got me curious. It was a pretty widely held belief that the stock intake was best, so for Subaru to come out with one… I also have to confess that I had the opportunity to talk to one of the people that helped develop this intake at Subaru, and he assured me that they had spent a lot of time developing this intake to work properly, and to make power. But I had to see the numbers for myself. Now on to the testing. What we decided to do was to take out as many variables as we could so that we knew that any gains that we saw on the dyno would be clearly attributed to the changes we made, and nothing else. We wanted to perform the testing in a short amount of time so the atmospheric conditions would be the same for all the tests. We also decided that we would re-set the ECU with the Access Port after installing each filter so that they would all be starting from the same learning point. We would then do between 7 and 10 pulls to allow the ECU to adapt to the new system. Then we let the car cool off for 20 minutes, after which, we let the car come back up to normal operating temperature, and did a few more pulls to make sure that we were getting consistent numbers, and that would be our result. One more key testing point was that we performed all the tests with the hood closed to try to better simulate actual driving conditions. So here is what we found. On this graph, run number 46 is the car with a brand new Subaru filter, 49 is the car with the Perrin filter, and run 58 is the SPT intake. All of there are of course on our Project Car, with the Cobb Stage 2 Protune that you can read about in our previous installment. I will tell you what run number 68 was in a moment. From looking at this graph, you can see that we gained about 4 ft/lbs of torque over the stock filter with the Perrin between 3,500 rpm to 5,500 rpm, and gained about the same over the Perrin with the SPT over the stock range. All in all, the panel filter is definitely a great modification for the cost, but the SPT definitely out performs it. Now, we did measure the intake temperature for all the tests, and it was pretty consistent at 90 deg. Fahrenheit no matter what system we were using, so I believe that the heat shield on the SPT intake definitely does its job. We did get a temperature spike once with the SPT intake, but we let the car idle for a minute with the fan still on, and the intake temperature immediately dropped. Now, what was really interesting was what the Ignition Advance Multiplier did. First, the Subaru ECU is dynamic. It is always looking at the information it gets from its sensors and trying to make more power. This is what people often refer to as “learning”. One way to gauge how well this is going is with the Ignition Advance Multiplier, or IAM. This is a measure of how much more timing the ECU feels it can run with out putting the engine in jeopardy. The higher this number, the more power you are getting just by your ECU being a little more aggressive. When we re-set the ECU before each test, the IAM goes back to its starting point of 12. With each of the panel filters the IAM would stay up for a run or two, and then go to zero, and once it did, we couldn’t get it to come back. (One possible explanation for this is that the car was tuned with this set up, and was pushed pretty much to the max, so there wasn’t much room if any for the ECU to change anything). However, with the SPT intake, the IAM would stay at 12 no matter if we heat soaked the intercooler, or engine by doing successive pulls. Basically, the engine was telling us that it was happier with this intake than with either of the panel filters. This leads me to run number 68. Kris had the feeling that with the SPT intake there was some more room for tuning, so he spent literally 10 minutes, and tinkered with a couple load sites and the result is that run. This is easily the best result, and notice that we never drop below 200 whp after about 5,000 rpm. He definitely felt that there was more power potential there, but it was too late to really explore that. I have now been driving around with the car for a little over a week, and I can say that it does feel like there is a little more power, but more than that, it seems like the turbo is a lot quicker to spool between shifts. 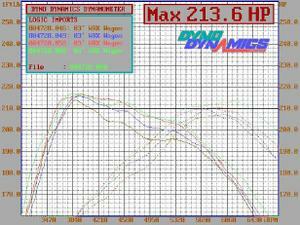 I also think that it feels like the car is pulling harder in the higher rpm range than before, as the dyno chart shows. Over all, I am very happy with the results, and am now sorry that it took me a few years to warm up to the idea of an intake on my WRX. I have to say that these are by no means the ultimate power numbers that these intake systems will produce. It is entirely likely that if the car had more time to learn between testing that it may have been able to deliver higher results for each intake. The problem there is that the more time goes by between each test, especially if we are talking days or weeks, there is a greater chance of outside conditions skewing the results. Also, what we were looking at here was the merits of each system, given as close to identical conditions as possible. By keeping the tests close together, and not letting the ECU learn too much, what we are looking at is a more accurate assessment of the individual merits of each system. Wow, that helped out a lot, I know a lot of people say that there arent any gains between stock intake and CAI, but then again, if there wasnt then why would CAI's be made in the first place? Anyway, my real question is, is it hard to install an SPT CAI? I know you used an access port, but to me, thats much more money than I have right now, is it absolutely neccessary to use the accessport when and if I install an SPT CAI? Thank you for your question. Installation was actually pretty simple. All you need are a couple of simple tools which are layed out in the instructions, and you should be able to get everything on in about an hour or so. As for the engine managment, you don't need anything if all you are doing is installing the intake because it is designed to work with factory MAF calibration. Thanks, and good luck with your car. i was just wondering if there is any difference between the cobb sf intake and the spt intake. Also if u guy have tested the cobb sf how do u like it i like the spt but a little pricey with heat shield but really like design and the same with the cobb the only things i dont like about the cobb sf is that they dont offer shield or the hanger for the lines if. If u could let me no your opinion on the two. Thanks for all the info, it was a really big help. I was just wondering if the K&N Typhoon intake is designed to work with the stock MAF on my WRX... the K&N site wasn't much help. Any idea? Jonathan, you've probably found the answer to your inquire by now, but if not... Yes, the Typhoon works just fine with the stock MAF. I had one on my STi, before having to ditch it because of a FMIC intercooler upgrade. I have researched a lot into tuning the car and found this site very helpful with the first step the intake, I love the SPT, sham ei cant get it in the UK but i am still hunting, my question is wil it fit the 2003 WRX UK or is it for the bug eye only? Hi again , i went ahead and bought the SPT despite lots of negative chatter on other forums, i love the sounds you get after fitting it with the bov etc and was wondering if you still have it fitted and /or found any snags with it running rich/lean? Thank man.its really a good and helping post by you.you really don't know solved my problem with this post. Hehe, good thing you tested everythin'! The help that Kris and Mike put in probably put you and the car at ease. It also seems like you are very knowledgeable about cars and their parts. How did you learn all that? 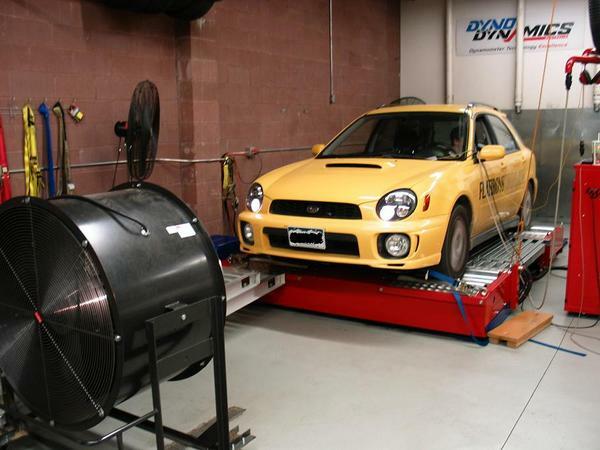 Did you guys use a heatshield when doing these dyno tests or did you feel it was unnecessary because the car was sitting still with a fan blowing into it during test? Reason I ask is because I have a SPT intake with the SPT heatshield going on my 2006 WRX, I am about to install and reset ECU after install. My car is mildly tuned with Blouch 16G-XT turbo, STI TMIC, EBC, and 3" TBE. Stock turbo inlet is being retained until I get a tune but I really wanted to get this SPT intake and heatshield installed now instead of waiting for the Gimmick turbo inlet. From your pictures, it doesn't look like you used the heatshield. Hello Cory. Thank you for your question. The SPT Intake should not need a custom tune on your car, but as you say, you will get the maximum benefit once you have your car tuned. As long as you are getting a tune shortly after installing the part, I'd say you should be fine. And also, the heat shield is a must with this intake. This is what keeps the inlet temps close to ambient, and what really makes the intake work. Thanks for the response. Everything was removed and installed very quickly with the intake. I'd say 20 minutes for it all. Initial impressions are this intake sounds fantastic and after about 200 miles I can say I can feel an improvement in spool and a bit more kick in the pants but I wouldn't write home about it in power increases. Anyhow, loving the intake sound and spool response. The sounds is honestly amazing. At initial ECU reset it took about 150 miles for boost to return to 24 lbs in 4th/5th as it was with the stock intake. But once it hit that 150 mile mark, it was back in full force. Combined with the Rallispec STi RA gear set and kit I bought and installed from you guys, that clutchmasters stage I clutch, and my recent 16g turbo and upgrades, the car is an absolute blast to drive to work each day. This is good paper work if your doing a project for your car. Very informative and really lots and lots to learn from! Thanks! This is a good article. Needed information for most asked questions are well explained. It is important to choose the right intake and check first its details before installing to have a good one. I believe that inventions of new materials has its own uses and if it works or not, that indicates only how was the manufacturing and production of materials. Hi, I'm from the uk and own a 2003 sti type uk, I've just purchased a spt intake after reading your article, which I found very usefull by the way! I'm wondering if there's anything I need to do once I've fitted the intake, I.e you mentioned resetting the ecu? Is this necessary? And if it is how do I do this? Any help would be great thanks Frank. That's quite a lot of work. But you guys managed to pull it through to the end. Love how you did it. Thanks! I could see that a lot are active and giving comments on your blog and that only shows that this is really interesting! It is nice to read this kind of blog because a lot of information and details are included. This will serve as guide on installing intake on cars. Very helpful! I am really amazed by how air intakes work on cars. At first it was just the same old part that's being installed for just a little reason but when I tried, my expectations were surpassed. It is good that it helps how the car performs. It is important to know how the parts and system of the car function.